This USB Voice Recorder is definitely one piece of spy gear that you should consider. This two-in-one flash drive and recording device that makes your audio recording discreet and you can record up to 40 – 320 hours of audio. Remember the old days when your only option was that crappy cassette tape recorder? Now you'll be able to hold a massive amount of audio in a small flash drive that fits right in your pocket! Whether in a library or at school, conversations and lectures are now able to be captured on this cool little tool. With memory able to capture up to 40 hours of audio (and a massive 160 hours with the upgrade), you will never miss an important event. This wireless USB is your very own audio recording system at the easy flick of a switch. The voice recorder is a USB drive so you can quickly plug into any computer and upload and email your recordings. No software to install. Perfect for the busy student who can't miss a note. All your classes can easily be transferred to your computer. Never miss what the boss says due to slow note taking. Now you can discreetly record any important business and directly upload it at work. Protect yourself with audio proof of whatever conference or conversation you may have. 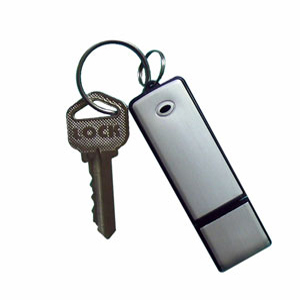 Looks just like a USB drive so no one will know you are recording if you don't want them to.